As you know from past updates, I have received two small deliveries of bricks, built the portcullis and finished some minifigures for the 6080 King’s Castle. My project took another step forward as I started dismantling my old sets for bricks and combined these with the newly acquired pieces. 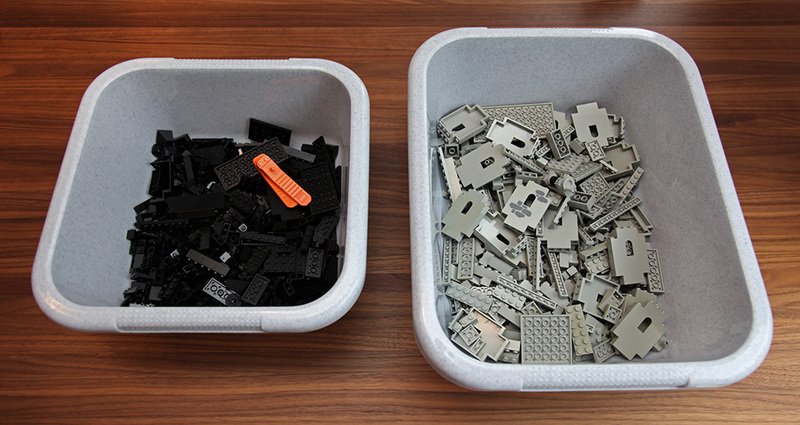 I decided to sort the relevant bricks by color: castle grey and black. Sorting by color is often recommended in LEGO building tips, so I thought I’d give it a try. Other bricks from my collection I’ll keep handy nearby, unsorted. It took me around an hour to dismantle, collect and sort the relevant bricks from the most obvious places. You can see the results in the picture. Also, I have separated minifigures and accessories such as shields and flags (not pictured). I still have more generic grey and black pieces tucked away elsewhere, but I’ll look into sorting those later. I can start building with this. I used two orange 630 Brick Separators (also seen in the picture) to help the process along and they worked great. Using two of them was especially useful when twisting two 1×2 plates apart. Also, the flat end of the separators worked well as a prying tool when lifting flat (non-studded) tiles from baseplates. There was a familiar smell of decades old dust in the air as I sorted away. In the end, sorting by color seems to work well. It is fast to do and requires relatively little in terms of space or containers, yet looking for parts is much simpler now that you simply have to look for a shape instead of digesting a cacophony of colors. Unfortunately, I do know my sorted boxes contain too many unnecessary pieces and too few necessary pieces, but I’ll cross that bridge when I get there. Next up, washing and bricklaying.